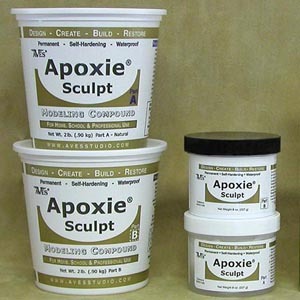 Apoxie Sculpt is a popular two part synthetic clay with a smooth consistency akin to that of putty. With versatile properties and ease of use, Apoxie Sculpt is considered at the forefront of hobby clay thanks to its lightweight characteristic and the fact that it has little shrinkage or cracking. When using Apoxie Sculpts, here are a few tips to ensure optimal results. When adding pigment to Apoxie, it’s pretty difficult to get an accurate result if you’re trying to match the apex to another material. Due to the fact that the Apoxie Sculpt is slightly grey in colour, it makes the results of pigmentation hard to estimate before drying. Use silicone rubber tools, which are available in any art store. They’re the easiest to clean Apoxie sculpt and they don’t break down over time. Silicone rubber tools are insusceptible to the Aves Safety Solvent that many people use to break down Apoxie Sculpt. Metal tools are also useful, as they sustain themselves over time and the user can learn to customize their work to the tool over time. Sculptors shouldn’t mix up more clay than you can use within a few minutes. Apoxie Sculpt generally has an open window of three hours before it becomes unworkable so it’s best to work in sections. When first blended, Apoxie Sculpt is very crumbly and sticky, so users should follow the instructions from the container and wait an hour before starting their project. For hard finishing details, you should wait for the product to cure for 24 hours before you begin any sanding, tapping, or drilling. Learn more techniques and tips such as this by contacting one of our customer service representatives who would love to guide you on cultivating your new hobby. Our prices are competitive and reasonable, and we strive to provide you with the service and quality you require. At Dalchem, we’ve outfitted our team members with authoritative knowledge on the products we sell. Dalchem is a specialist Melbourne supplier of Apoxie Sculpt that is used by hobbyists and household businesses alike.